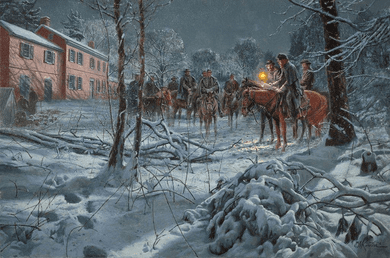 Mort Künstler Hand Signed and Numbered Limited Edition 2012 Official Snow Print:"Shenandoah Strategy "
Edition Size: Artist Signed and Numbered with COA to 50 Artist Proofs. Premiere Canvas limited to 15. Image Dimensions: Limited Edition Print Image size: 19" x 29" / Overall size: 24" x 33" Canvas Sizes: 40" x 26"
About the Edition : The 2012 Snow Print Release marks the 1st of 8 final releases from Mort Künstler and his impending retirement to coincide with the 150th anniversary of the end of the civil war on April 9th, 2015.